The Old Town (Scots: Auld Toun) is the name popularly given to the oldest part of Scotland's capital city of Edinburgh. The area has preserved much of its medieval street plan and many Reformation-era buildings. Together with the 18th/19th-century New Town, it forms part of a protected UNESCO World Heritage Site. The "Royal Mile" is a name coined in the early 20th century for the main street of the Old Town which runs on a downwards slope from Edinburgh Castle to Holyrood Palace and the ruined Holyrood Abbey. Narrow closes (alleyways), often no more than a few feet wide, lead steeply downhill to both north and south of the main spine which runs west to east. Significant buildings in the Old Town include St. Giles' Cathedral, the General Assembly Hall of the Church of Scotland, the National Museum of Scotland, the Old College of the University of Edinburgh and the Scottish Parliament Building. The area contains underground vaults and hidden passages that are relics of previous phases of construction. No part of the street is officially called The Royal Mile in terms of legal addresses. The actual street names (running west to east) are Castlehill, Lawnmarket, High Street, Canongate and Abbey Strand. The street layout, typical of the old quarters of many northern European cities, is made especially picturesque in Edinburgh, where the castle perches on top of a rocky crag, the remnants of an extinct volcano, and the main street runs down the crest of a ridge from it. This "crag and tail" landform was created during the last ice age when receding glaciers scoured across the land pushing soft soil aside but being split by harder crags of volcanic rock. The hilltop crag was the earliest part of the city to develop, becoming fortified and eventually developing into the current Edinburgh Castle. The rest of the city grew slowly down the tail of land from the Castle Rock. 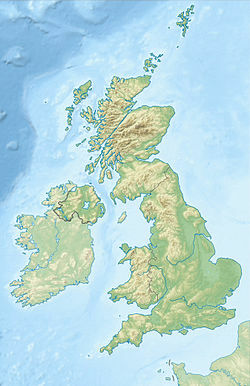 This was an easily defended spot with marshland on the south and a man-made loch, the Nor Loch, on the north. Access to the town was restricted by means of various gates (called ports) in the city walls, of which only fragmentary sections remain. The original strong linear spine of the Royal Mile only had narrow closes and wynds leading off its sides. These began to be supplemented from the late 18th century with wide new north–south routes, beginning with the North Bridge/South Bridge route, and then George IV Bridge. These rectilinear forms were complemented from the mid-19th century with more serpentine forms, starting with Cockburn Street, laid out by Peddie and Kinnear in 1856, which specifically improved access between the Royal Mile and the newly rebuilt Waverley Station. St Mary's Wynd was demolished and replaced by the much wider St Mary's Street with all new buildings. Leith Wynd which descended from the High Street to the Low Calton was demolished. Jeffrey Street started from Leith Wynd's junction with the High Street, opposite St Mary's Street, but bent west on arches to join Market Street. East Market Street was built to connect Market Street and New Street. Blackfriars Street was created by the widening of Blackfriars Wynd, removing all the buildings on the east side. Chambers Street was created, replacing N College Street and removing Brown Square (west) and Adam Square (east). It was named after the then Lord Provost of Edinburgh, Sir William Chambers, and his statue placed at its centre. Guthrie Street was created, linking the new Chambers Street to the Cowgate. 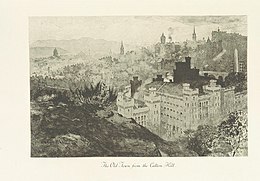 Image of the Old Town from Calton Hill taken from page 179 of 'Edinburgh: Picturesque Notes' (1896) by Robert Louis Stevenson. Etchings by A. Brunet-Debaines from drawings by S. Bough and W. E. Lockhart. Due to the space restrictions imposed by the narrowness of the "tail", and the advantages of living within the defensive wall, the Old Town became home to some of the world's earliest "high rise" residential buildings. Multi-storey dwellings became the norm from the 16th century onwards. Many of these buildings were destroyed in the Great Fire of Edinburgh in 1824; the rebuilding of these on the original foundations led to changes in the ground level and the creation of numerous passages and vaults under the Old Town. The construction of new streets including North Bridge and South Bridge in the 18th century also created underground spaces, such as the Edinburgh Vaults below the latter. Traditionally buildings were less dense in the eastern, Canongate, section. This area underwent major slum clearance and reconstruction in the 1950s, thereafter becoming an area largely of Council housing. From 1990 to 2010, major new housing schemes appeared throughout the Canongate. These were built to a much higher scale than the older buildings and have greatly increased the population of the area. During the Edinburgh International Festival the High Street and Hunter Square become gathering points where performers in the Fringe advertise their shows, often through street performances. On 7 December 2002, the Cowgate fire destroyed a small but dense group of old buildings on the Cowgate and South Bridge. It destroyed the famous comedy club, The Gilded Balloon, and much of the Informatics Department of the University of Edinburgh, including the comprehensive artificial intelligence library. The site was redeveloped 2013-2014 with a single new building, largely in hotel use. An area directly to the north of the Canongate has been earmarked for a large redevelopment project named Caltongate. The scheme involves building of a mix of residential, hotel, retail and office buildings on the site of the former SMT bus depot in New Street, developing the arches under Jeffrey Street, redeveloping other surrounding sites and creating a pedestrian link from the Royal Mile to Calton Hill. The proposals have been criticised by commentators including the author Alexander McCall Smith and Sheila Gilmore MP who regard the modern design as incompatible with the existing older architectural styles of the Old Town and inappropriate for a UNESCO World Heritage site. The Caltongate development has also been opposed by the Cockburn Association and the Architectural Heritage Society of Scotland. The site developers Artisan Real Estate Investors have stated that the completed development will be a "vibrant, exciting" place. The plans were approved by the City of Edinburgh Council in January 2014 and construction was due to begin later in 2014. 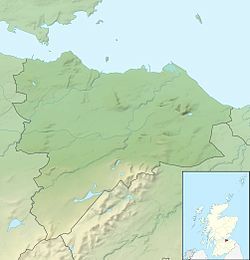 Wikimedia Commons has media related to Old Town of Edinburgh. 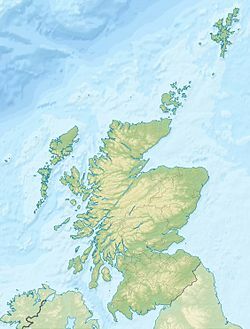 Wikivoyage has a travel guide for Edinburgh/Old_Town. ^ "Edinburgh-World Heritage Site". VisitScotland. Archived from the original on 22 February 2013. Retrieved 10 February 2013. 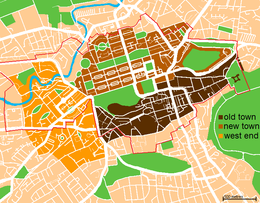 ^ "Caltongate masterplan". Frameworks, masterplans and design briefs. City of Edinburgh. Archived from the original on 19 February 2014. Retrieved 30 January 2014. ^ "Caltongate development approved by Edinburgh Council". Scotland on Sunday. 29 January 2014. Retrieved 30 January 2014. ^ "The Caltongate Development". Cockburn Association. Archived from the original on 1 February 2014. Retrieved 30 January 2014. ^ David McCann (30 January 2014). "Caltongate work to start in summer". Edinburgh Evening News. Retrieved 31 January 2014.